When the company won a new monthly order to produce 700 valves, it faced a real production challenge. “Our CNC machine can normally do 400 valves per month with two shifts, so we would have been forced to buy another machine even if we put a third shift on,” says Escalette. Instead, though, the company invested in a UR5 collaborative robot. 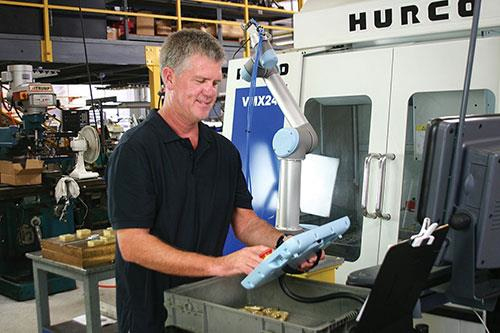 RSS put the robot to work 24/7 and met the order in 11 days while opening up 30 percent more capacity on existing machinery. 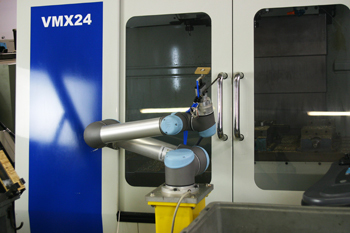 “In a flexible environment like this, you need a flexible robot. One that can work without safety cages, one that is portable, and one that can be reprogrammed quickly,” says Escalette. RSS has put the UR5 to work with a Hurco CNC machine and a mandrel tube bender. Before deploying the UR5, RSS automation and integration specialist Shane Strange put it through safety assessments, using various accelerations and joint speeds, running the UR5 up against people’s hands to test how much force it would actually take to fail out the robot. “The robot is surprisingly sensitive to outside force and will immediately stop when colliding with a person. That enabled us to run it without safety cages,” says Strange. Setting up the robot took 45 minutes, including unpacking, mounting and programming the first simple pick and place moves. It took RSS a total of eight hours to create the complete setup including all tooling. 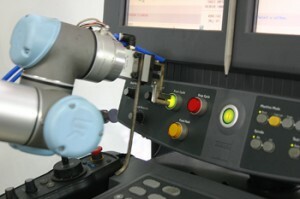 Visit the Universal Robots website for more information.